At this time of the year, it is harvesting time in the family backyard and we have lots of fresh cucumbers to work with. Cucumbers by themselves have a great fresh smell and taste that quickly reminds one of summer and fresh vegetables in general. But the flavor is also extremely light because of the high water content in them. 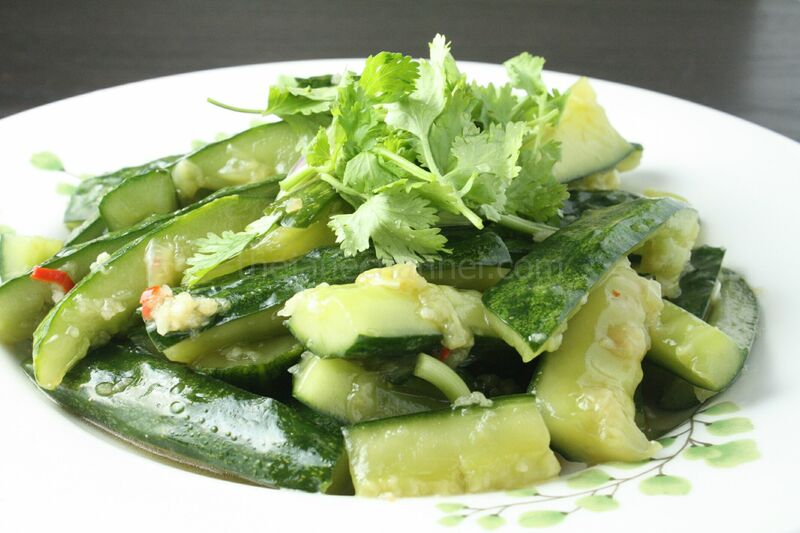 Marinated cucumbers is often served as an appetizer in a Chinese restaurant. It is also served after eating a lot of fried foods and oily dishes in the New Year. The subtle balance of saltiness, sourness and sweetness can really boost one’s appetite. As with many Chinese dishes, achieving a desirable smell is important. In this case, the sesame oil, garlic, and fish sauce combined with the fresh smell of cucumbers really define the dish. Marinating achieves two important goals: firstly to draw the water out of the cucumber so that it becomes more crunchy and to concentrate its flavors, and secondly to impart flavors and a desirable smell into the somewhat bland cucumber. To achieve the second goal in particular, a key step in the preparation of the dish is to “smash” the cumbers before the marination process. Smashing the cucumbers has the effect of producing rugged edges, increasing the surface area of the pieces of cucumber and therefore making the seasonings more easily absorbed. I have noticed that the fresher the cucumber, the higher the water content seems to be. With the freshest cucumbers, like I am using here, a longer marination process is recommended. For example, I made a batch last night by marinating for about 3 hours. To my surprise, they were even better today after being refrigerated overnight! Using a large knife, preferably a cleaver, smash the cucumber on the chopping block, until the cucumber cracks open. 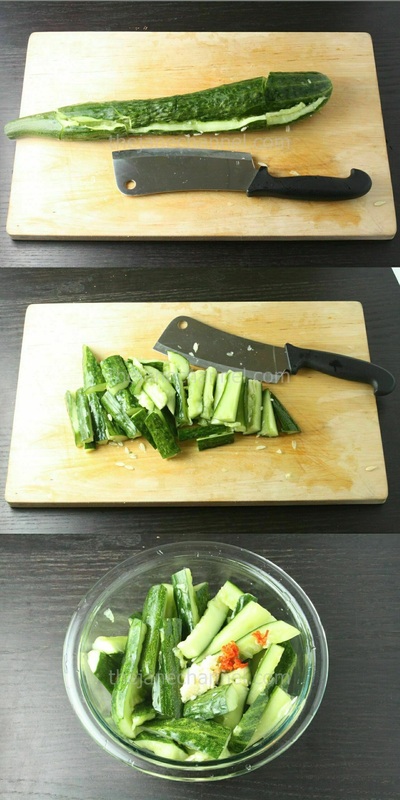 Remove the seeds inside of the cucumber, then chop them into smaller pieces (about 1.5 inches long). Add 1 tablespoon of salt and refrigerate for 1 hour. You should notice that a significant amount of liquid has emerged. Rinse off the salt and drain. Add 1 teaspoon soy sauce, 1 teaspoon sugar, 2 minced garlic, and 1 chili. Mix well and refrigerate at least another 2 hours. Drain the excess water from the cucumbers again. Add fish sauce, 1 teaspoon sugar, 1 minced garlic, 1 chili, and sesame oil. Top with cilantro to serve. You may serve the dish now or refrigerate even longer for the best taste.